Home > Outreach > Why Keep Collections? 1. What do fossils tell us? They allow us to follow the evolution of life on Earth. Without fossils we would not know that trilobites or dinosaurs or rudists ever existed. Neither would we know that there have been major extinctions in the past. They record global change in climate, geography, biodiversity, and chemistry of the oceans. They give us an important means to determine the age of sedimentary rocks and provide clues to possible natural resources. 2. Why keep them after they have been studied? Apart from the fact that they are just ‘cool’ specimens….some must be kept for reference purposes. A few specimens are selected to represent each newly described species, those are called the ‘type’ specimens. When new related species are being described they are compared to these type specimens. Sometimes it is the specimen in the collection that provides the clue, the missing link, to solve the mystery fossil puzzle such as the famous ‘conodont’ animal case. The teeth of a lamprey-like conodont. The image is 250X life size, the scale bar equals 120 microns. For a long time the conodont animal, the organism that contained these tooth like fossils, was a great source of speculation. What was known was that the tooth like structures found as fossils changed their color, seemingly linked to their amount of ‘cooking’ (burial and metamorphism). This color guide proved very useful for telling the maturity of oil and gas reserves. Tiny ‘teeth’, or conodonts, have been known for over a century to be of incalculable value in Paleozoic stratigraphy. The organism, to which the teeth belonged, was open to wild and varied interpretations. 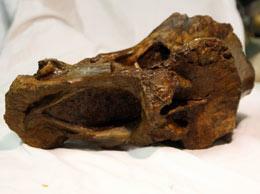 This was resolved with the discovery by Clarkson in 1982 studying specimens in the Natural History Museum. He discovered the first lamprey-like conodont animal illustrated here. Most of our conodont collection results from the work of Helen Plummer and later Samuel Ellison. Plummer was particularly involved in examining the Paleozoic rocks of North Central Texas. The find of this spine bone by graduate student Mike Taylor, led to his discovery of an entirely new genus of sauropod dinosaurs. Image courtesy of University of Portsmouth, U.K.
New sauropod genus lay unappreciated in London museum basement for 113 years. Where do you find fossils? Why Marine Fossils around Austin?